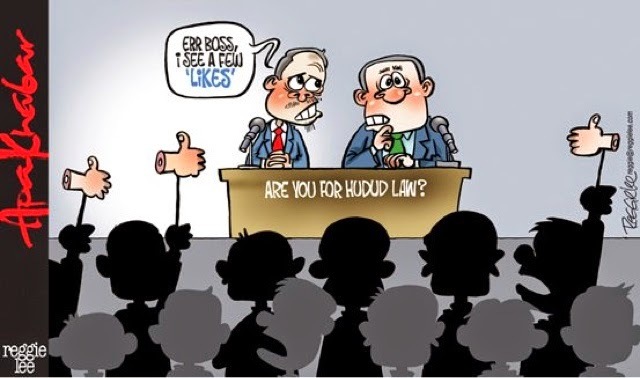 As the Hudud issue is being debated in the Parliament, many perceptions and responses towards the issue had been raised. 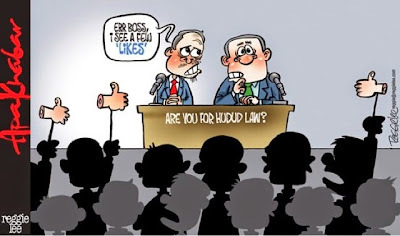 Judging from the multicultural atmosphere in Malaysia, the Hudud issue has becomes a nightmare of chopping hands and stoning for some muslims and non-muslims. This article will guide us to the simple and basic principles of Hudud, according to the Islamic Law (Asy-Syarīah Al-Islāmiyyah). Islam requires a thorough background check to be done before judging someone for being guilty. As to this, there are several requirements Ifor one to be subjected according to the Hudud law . For example in a case of stolen items (as-sariqah), there must be testimonies (asy-syahādah) from two just witnesses (asy-syāhidān al-ādilān). The testimonies must be the exact same and if there are even slight differences in these testimonies (in the time of steal for an example) then the criminal will not be subjected according to the Hudud laws. This condition ensures that no one is easily framed by another person. In addition, the stolen item must be worth at least a quarter of dīnār, anything less than that will not subject the criminal under the Hudud law. This requirement is according to the hadīth by the Prophet, narrated by Imam Ahmad and Muslim; لا تقطع اليد إلا في ربع دينار فصاعدا which means " Do not chop the hand, except only in the quarter of a dinar onwards". The stolen item should have also been kept in a well secured (al-hirzu) place. The security differs according to the item and country. Given the item was in a public area and not secured properly, then it will not subjected to the Hudud law. As Islam is a fair and just religion to all mankind, it never discriminates anyone including a criminal. Islam also states that the criminal must not in such a condition that requires him to steal, for example he should not be suffering from poverty and starvation, or in a condition where he is forced to steal. Islam is a true religion from the true God Allah, surely He knows best for His creations. These are several conditions (in fact there are more conditions stated) to be met for the crime to fall under the Hudud law. If the conditions are not met, then the case will named as a crime commited due to certain circumstances in which the criminal would not get his hands chopped off. Aisha RA said, The Messenger of Allah, Peace Be Upon Him: "Avert the Hudud for Muslims as you can. If there is an exit (from the Hudud), hence, pick the way. It is better for the Imam to be wrong in pardon than to be wrong in punishment". Narrated by Imam Tarmidzi. Cutting off people's hands just because it meets the conditions prescribed in 7th Century Arabia is no reason to do the same in the 21st Century Malaysia. People are more civilised today, as illustrated by the dramatic decrease in violence per capita in the intervening centuries (Pinker 2011). It would be a tragedy for Malaysia if it reverted to such primitive punishments for its Islamic citizens.